"Brethren, we are here gathered together as one family to remember before God those whom we have known and loved in this place; and who, by sea and land and air, have in this war given their lives for their country and for us. Sorrowful, yet proud, in love and in sure confidence, we are to commend their souls to Him Who promised: Be thou faithful unto death, and I will give thee a crown of life. We also commemorate Joseph Andrew Martin Blogg, a servant of the College." Following the service a memorial plaque was unveiled, permanently commemorating all Members who lost their lives in the war. The war memorial ends: "Their bodies are buried in peace but their name liveth for ever more." This remained on display in the Hall until the Second World War, after which the tablet was moved to its current location under the western portico of the North Range. This location is especially fitting as responses to an appeal in July 1920 for ideas for a lasting memorial to those who had died had favoured a new building providing undergraduate rooms, although it was not until 1931 that the College began construction of the new North Range. The following Downing member, Frederick Rotherham Cecil, is not listed on the war memorial. He is, however, commemorated on the Commonwealth War Graves Commission website and more information can be found on Frederick Rotherham Cecil here. The College Archivist is currently preparing biographies of all those who died during the war. These will be published and linked to the Roll of Honour above to mark the centenary of each of their deaths. 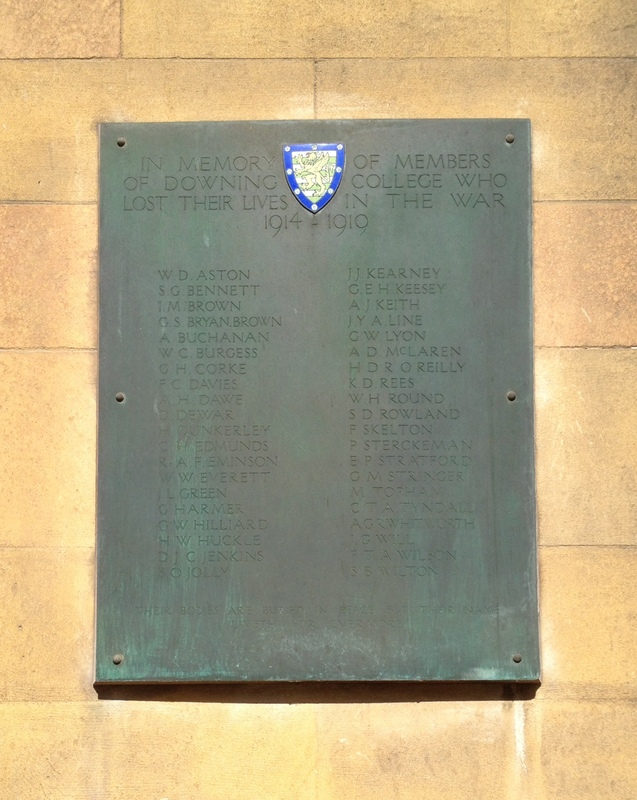 An article on Downing and the outbreak of war is now available online.